How much luggage will it hold? Heavy duty molded hitch cargo box. 12.5 cubic feet capacity. Available in black or ivory colors. Made in the USA. Ten year product warranty. 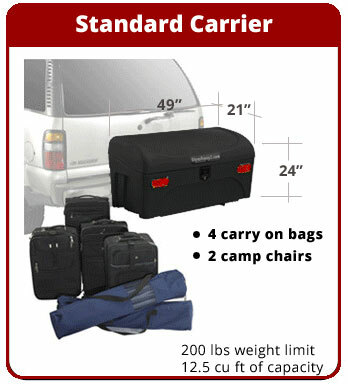 Whether you have an SUV, RV, van or truck the StowAway Hitch Cargo Box is the ideal choice for carrying your gear. When it comes to choosing the right StowAway Cargo Box there are several things to consider. You want to make sure you’re getting exactly the hitch box that works for you and your family or business. How much gear do you anticipate carrying? How important is rear access to your vehicle? Are you trying to complement your vehicle’s color? Are there some StowAway accessories like the wheels, lid rack or buffet board that might make using the StowAway that much easier? Either way, let us assist you in choosing the best hitch cargo box and accessories for your needs. First things first, how much weight can your vehicle and your hitch support? What’s important for the StowAway or any hitch carrier is tongue weight capacity, and both the vehicle and the hitch receiver have a specified tongue weight capacity. When a vehicle comes equipped with a factory hitch or tow package the tongue weight capacity for the vehicle and the hitch are generally the same. When an aftermarket hitch is installed it is not uncommon for the hitch capacity to be different than the vehicle capacity, and you should use the lowest of the two in making your hitch carrier decision. Most of the StowAway Boxes are able to accomodate 200 lbs of gear, so with the weight of the frame and box (approx 100 lbs), and the gear you’re packing, you could total up to 300 lbs. You want your vehicle and your hitch to be able to support this weight. In addition, how much room do you need for your gear. Will you be packing lighter but bulkier items, or heavier but smaller items? Our StowAway MAX Hitch Cargo Box is larger and offers 16 cubic feet of gear capacity, while our smaller StowAway Standard Hitch Cargo Box offers 12.5 cubic feet of gear capacity. The dimensions and sample loads for each box model can be seen here . Once you know your tongue weight capacity and how much room you’ll need, you’ll be one step closer to finding the right cargo box for your needs. What kind of vehicle and hitch do you have? Hitches come in three sizes, 1.25”, 2” and less commonly 2.5”. These measurements are the length of the inside wall of the hitch opening. Hitches are also rated by Class with Class I hitches being the lowest capacity hitches and Class 5 hitches being the highest capacity hitches. The StowAway hitch cargo boxes are designed for Class 2 through Class 4 hitches, which are generally mounted to RV’s, Vans, pick up Trucks, Trailers and mid to large size SUV’s. Sedans and smaller SUV’s can sometimes accommodate a StowAway Carrier if they are rated for a tongue weight of 200 lbs or more. 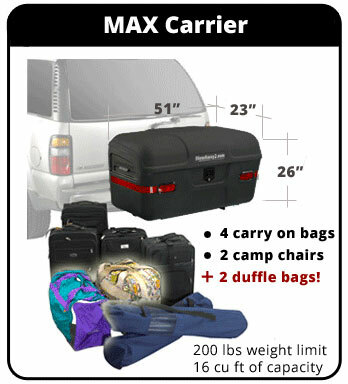 Our Max Cargo Box is designed for Class III and Class IV 2” hitches with a 300 lb tongue weight minimum for both the hitch and your vehicle. Our Standard Cargo Box will fit either 1.25” hitch or a 2” hitch, with a 200 lb tongue weight minimum for both the hitch and the vehicle. The Max Box is the most popular on mid size and larger vehicles while the Standard Box is most popular on smaller vehicles. There are a number of choices for transporting more gear than your vehicle itself can accommodate. Roof boxes, trailers and a range of hitch carriers are all commonly available, so why choose a StowAway Carrier? Here’s why. As a hitch mounted cargo box the StowAway boxes offer easy ground level loading and unloading, without sacrificing access to the back of your vehicle. No need to teeter on the door jam or stool to lift the gear up over your head to get it into the carrier. Roof boxes can also be limiting in the size and shape of things that can be loaded, and usually top out at 125 to 165 lbs capacity. For skis and snowboards roof boxes are good, for just about everything else a hitch mounted box is easier to use and more functional. Pulling a small trailer with your gear is certainly an option. But pulling a trailer makes driving a little more complicated and seriously limits your parking options. And where do you store your trailer when you’re not using it? When developing the StowAway Carriers we decided to focus on function, versatility and value. Customers told us that they wanted easy access to the back of their vehicle. They wanted their carrier to be easy to load and use, and ideally be helpful for a range of activities. And they wanted something that would last over time under a range of conditions and applications. We like to think that we’ve been able to achieve these goals. Function - Our Cargo Boxes offer an easy to use locking latch and swing out for clear access to the back of the vehicle. The swingaway frame opens with a simple pull latch and is secured with dual safeties when under way. Optional accessories can convert the box into a food station, or make the box easier to handle when off the vehicle. Versatility - We designed our frame for versatility. The cargo box can be removed from the frame and replaced with our hitch cargo rack, a bike rack, grill station, rod rack or a ski box for ski shuttles. Or you can mount your own device to the frame, and we’ve seen customer mount generators, anvils, custom grills and other platforms or tote boxes, all because of the versatility of the StowAway frames. Value - We build the StowAway carriers to last, starting with the materials we use. Our frames are welded using heavy duty tube and bar so they can support a load and last. Our cargo boxes are molded using linear low density polyethylene, the same polymer used to mold white water kayaks and offshore buoys. They are built not only to last, but to absorb the impacts that may occur while loading or unloading, and the occasional bump that might occur. And StowAway racks and boxes are backed by a 10 year. All things considered, we believe the StowAway Cargo Box offers the best value among the range of gear transport options out there.